Surely there is no-one better equipped to answer these questions than the WeAreDevelopers management team – Benjamin Ruschin (managing di- rector & co-founder), Sead Ahmetovic (managing director & co-founder), Thomas Pamminger (CPO & co-founder) and Jacqueline Resch (CCO). Sandra: Let’s start with an exciting question: What is WeAreDevelopers? 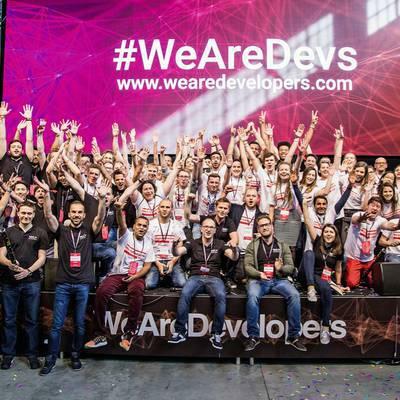 Sead: We founded WeAreDevelopers because we wanted to offer develop- ers a platform where they can connect with each other and with tech lead- ers from around the world. They can do this in two ways: one, through the annual WeAreDevelopers World Congress, the largest conference for de- velopers and IT professionals in Europe, and second, online on WeAreDe- velopers DevJobs (wearedevelopers.com/devjobs), which connects devel- opers with top tech employers. Benjamin: DevJobs is a service from WeAreDevelopers that helps devel- opers to find the right job by focusing on their needs and desires. Develop- ers are then matched with suitable tech employers that meet these needs. On our platform, developers and companies meet as equals. Sandra: What sets DevJobs apart from other career platforms? Thomas: At DevJobs we put the developer in the driver’s seat. Companies apply to us for developers, and not the other way around. Developers en- joy 100% anonymity on our platform, and it is entirely up to them which companies they want to contact. The developers receive customized job offers based on their needs, desires and expertise. We know what develop- ers want and need based on our own experience as developers, feedback from the community and what we have learned from our events. We con- nect developers and companies from the perspective of developers. Sandra: What else do you do differently? Jacqueline: We conducted research in the developer community. We asked developers what they think is important in a job and an employer, and how they go about looking for jobs. What we found is that most devel- opers are passive job candidates. They don’t actively look for positions. They don’t use traditional career platforms, they delete their LinkedIn profiles and they hide their contact details from headhunters and recruit- ing departments. Benjamin: Developers are increasingly moving away from traditional platforms such as LinkedIn, Stepstone, Xing and so on. We see the same trend when it comes to headhunting and recruiting agencies, most of whom represent only the interests of employers. Both of them have a neg- ative image in the developer community. Since these traditional recruiting channels no longer worked, the market called for a new solution – a solution that turns the tables and addresses the needs of developers. This is also the best way for employers to gain the loyalty of the best talent in the market. Sandra: What are your plans for the next 12 months? Sead: We want to further establish WeAreDevelopers in German-speak- ing countries. Opening our office in Berlin was a huge step in this direc- tion because Berlin is one of the biggest tech centers in Europe. This not only brings us closer to companies like IBM, VW, Bosch, Zalando and many others, we are also in the center of the German developer communi- ty. We are well-connected in the technophile CEE community, which is a big advantage for companies in the DACH region. Jacqueline: We have opened offices in Vienna, Sarajevo and Berlin with- in the last 12 months and have grown from 15 to 70 team members. A few weeks ago, we moved from a small start-up office behind the Vienna Votive Church to an office with more than 1,000 square meters of space. We are using this as our base to further expand our brand internationally. Sandra: How have you managed to grow so fast? Thomas: Simply by thinking bigger. Right from the start, we brought good, experienced people on board, partnered with Google, Microsoft, BMW, At- lassian and many others, and quickly established a strong brand with in- ternational appeal. Sandra: Diversity and inclusion – how important are these topics for you? Jacqueline: That is why we are devoting a lot of time and energy to ac- tivities related to these two topics. We are using the WeAreDevelopers World Congress to show companies how it should be done. For example, full-day childcare is available on all three days of our event. The kids can also take part in coding courses offered by CoderDojo. Speaker diversity has also been important from the start, and we’ve even set up a diversity fund to help participants from diversity target groups participate in the conference. Sead: We also practice what we preach. The WeAreDevelopers team couldn’t be more diverse. Our employees come from 20 different countries and more than half are women. We pro- mote an open, inclusive culture in our company. We also support good causes like Refugees Code, IT Girls, Coding Girls and many other like- minded organizations. Sandra: People. Code. Future. – what is that all about? Sead: “People. Code. Future” is the slogan of our conference. People, be- cause our congress is a place for people. The congress is the only time of the year away from keyboard (“afk”). Our congress is a place for people to meet, talk, code and network. You can search and find opportunities, friends and groups. It is our deepest belief that something completely new starts when you bring together people. Thomas: Code. Where developers come together code is more than a long sequence of letters and digits. Code is our tool of choice. We use it to com- municate, create and build. Code is breaking down walls society built and bridges the chasms of language. Ideas get products, lines of code become tools – out of the blue. Benjamin: Future. We embrace Future. We see it. We shape it. We create it. We code it. The future is today and sometimes you just have to take a chance. This year’s congress design is also about diversity. We believe in diversity and inclusion. The different dithering patterns of our conference design overlap and create something new. Let people, code and future come together to remix reality and create something new.